You know how you can just model an object in your favorite CAD software, send it to your printer, and watch it instantly start extruding molten plastic in the shape of your dreams? No you don’t; you’re lying. No one using Fused Deposition Modeling (FDM) gets to skip the process of digitally slicing their objects into the hundreds (or thousands) of layers that printers stack on top of one another to make your stuff. This can be one of the most boring aspects of 3D printing because the computer does all the work, but it can take a while, and there’s nothing to stare at (without looking crazy) like there is during the actual printing. If you’re experienced with personal 3D printing, you’re probably familiar with Skeinforge as it’s the go-to slicing software for many printers. The main reasons for the popularity of this software are that it’s open source and it works. Its popularity has naught to do with how quickly the software slices objects. If you were to model an apple and also buy a real apple, you could probably slice that juicy apple with a knife into the same amount of layers as Skeinforge does your digital version in the same amount of time. “But Cameron,” you say, “Skeinforge is the best we’ve got!” Oh no, random internet reader person, there’s better yet. Good news, everyone! Well, for everyone that owns a Bits From Bytes 3D printer at least. The coders at BFB have released AXON 3, improving upon their AXON 2.1 slicing software. Two major upgrades are enabled with this update, and speed is one of them. Under testing circumstances the newer AXON version sliced a model into 1,400 layers in less than a minute. The older version took almost half an hour on the same task, so comparatively AXON 3 is over 30 times faster than its predecessor. All those errands you ran and chores you got done during slicing time will have to be squeezed into the printing process now. Sorry moms/wives. Oh, that other upgrade? Multicolored printing. 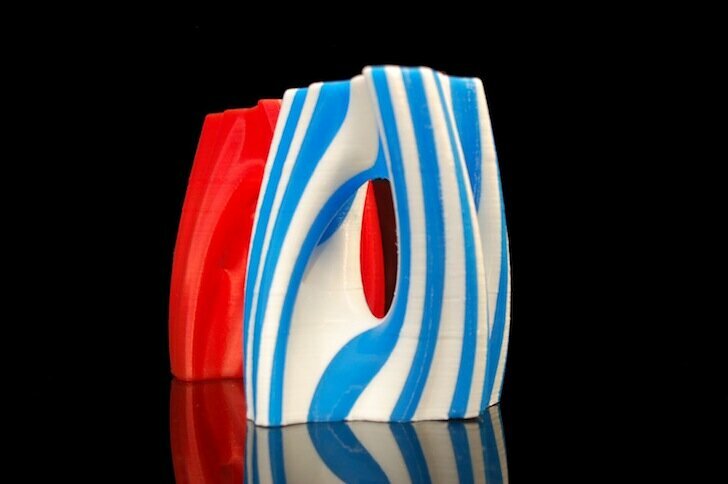 If your printer has two (or three) extruders, AXON 3 lets you print in two (or three) colors simultaneously. Technically they could be different materials too, but for best results it’s recommended that all materials be the same. The software combines separate models into one; objects of multiple colors will require multiple models. So if you want to print a blue toy car with grey wheels, you’d need to model the wheels and car separately in a manner that allows them to be combined smoothly. I feel this will soon change and software will be designed to achieve multicolored printing from single models that were simply digitally painted. 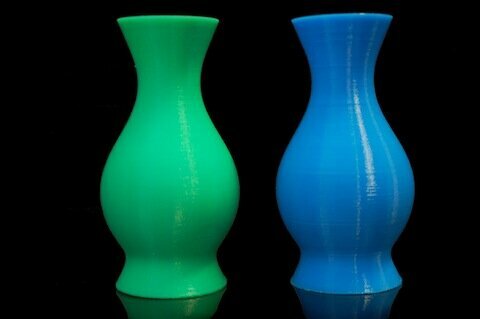 These two vases were printed simultaneously with the new AXON 3 software. For now AXON 3 is only compatible with the 3DTouch, but the BFB 3000 and RapMan will soon receive firmware updates for the software. There are a few directions this update could take us: more manufacturers of personal 3D printers writing more of their own robust software, Skeinforge getting beefed up to be faster and more user friendly, and possibly the entrance of a new open source slicer. I’m fine with any and all of the above. Cameron, Senior Staff Writer, is a technology enthusiast that can better write about 3D printing than he can ride a bike. His interest in 3D printing is mostly driven by his desire to become a cyborg. He enjoys philosophical conversation and is also fond of poetry and Star Trek. Connect with him on Google+.